If you’re wondering whether we’re still in a Golden Age of television drama, then look no further than “The Americans” on FX. The show stars Keri Russell and Matthew Rhys as deep-planted Soviet spies, fronting as parents of an All-American family living outside of Washington D.C. during the early 1980s. During its first three years, I’ve regarded it as an excellent drama, though perhaps a step below iconic classics such as “The Wire.” In the current season four, however, “The Americans” has moved to the next level. It is delivering other-worldly acting, morally complex storylines, and the look-and-feel of 1980s America and the last decade of the Cold War. It is riveting entertainment. 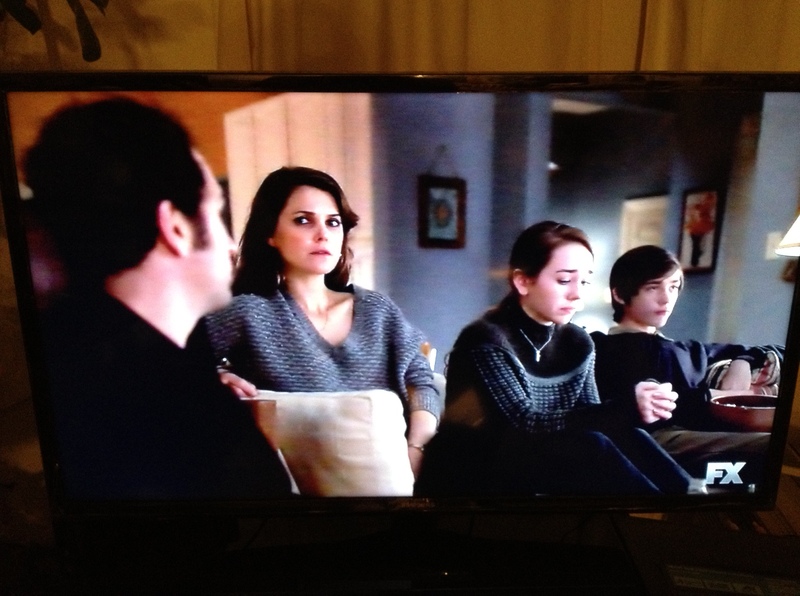 On “The Americans,” the characters all watch in stunned silence, including secret Soviet spies Philip and Elizabeth Jennings (Matthew Rhys and Keri Russell) and their kids, Paige (Holly Taylor) and Henry (Keidrich Sellati), and their friendly next-door FBI agent, Stan Beeman (Noah Emmerich) and his son, Matthew (Daniel Flaherty). Even the Russians who work at the Rezidentura in Washington tune in – Oleg Burov and Tatiana Ruslanova (Costa Ronin and Vera Cherny) watched it curled up on the bed. As seen on . . . “The Americans,” people really did set everything aside on the night of Sunday, Nov. 20, 1983, to watch ABC’s depressingly sober TV movie “The Day After.” It told the story of a handful of people in and around Lawrence, Kan., who had the misfortune of surviving an all-out nuclear war between the United States and the Soviet Union. Please understand: This was a television event in a way that we’ll probably never see again. You see, when it comes to watching stuff on screens, we’ve become increasingly atomized (pun intended). A century ago, a theater would bring together hundreds of people to watch movies and newsreels. Fifty years ago, folks watched programs with family and friends in front of television sets. Today, we often watch TV programs and movies in different rooms of the house or stream them on our various devices. 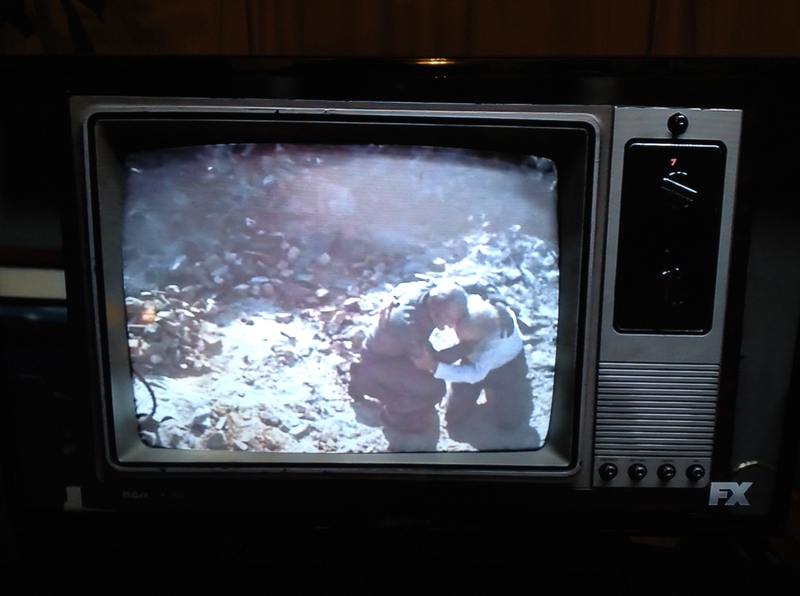 Americans viewed “The Day After” huddled together in front of our television sets. I was in my second year of law school at NYU, and a big group of us gathered to watch it in one of our dorm rooms. Today, with so many actual horrors captured on video and posted to social media, it may be difficult to grasp that this fictional movie was jarring and upsetting to many. But such was the case. We talked about it for days. The threat of nuclear annihilation was very real during this final decade of the Cold War. 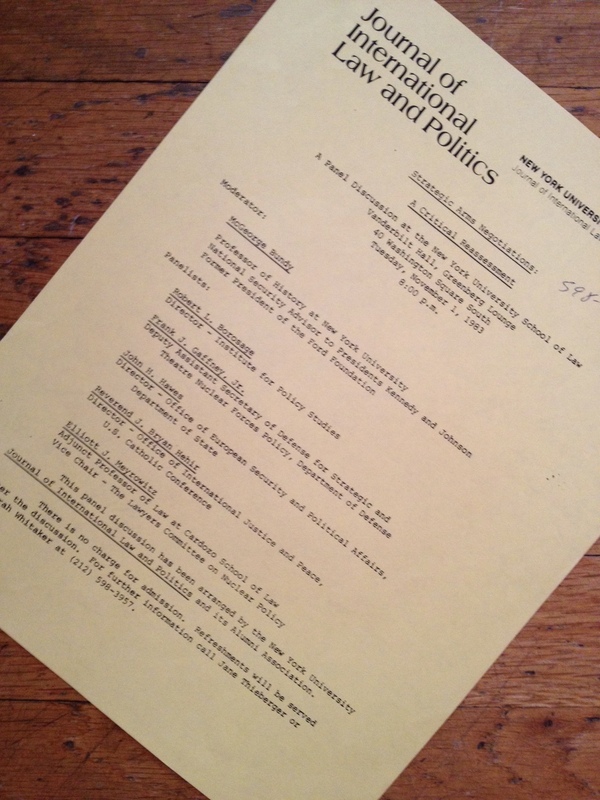 That same academic year, I was on the staff of NYU’s international law journal, one of several student-edited law reviews published at the law school. A few weeks before the airing of “The Day After,” our journal hosted a panel discussion on nuclear arms control, moderated by McGeorge Bundy (National Security Advisor to President Kennedy) and featuring a prominent group of diplomatic and military policy experts. The subject matter of the panel extended way beyond mere academic speculation, and I recall a tone of seriousness in the dialogue among the speakers. The U.S. and the Soviet Union were playing a dangerous cat-and-mouse game around the world. 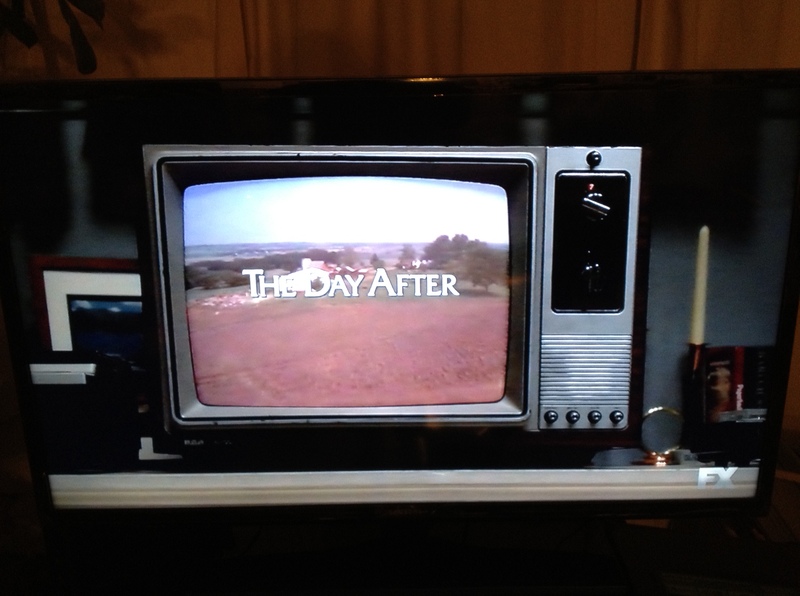 “The Day After” would show us what that meant with more dramatic effect. 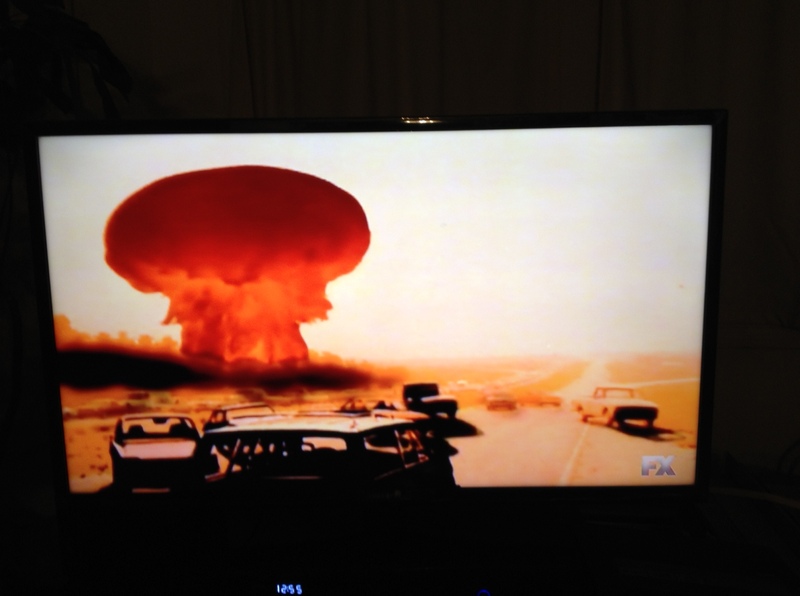 This episode of “The Americans” brilliantly brought back those memories. I save way too much stuff. I should’ve been an archivist. A personal note: At NYU Law, I volunteered to help out with that nuclear arms program. By doing so, I got to join the pre-panel dinner with the speakers in the faculty dining room. I mostly kept my mouth shut out of fear of saying something stupid. Nevertheless, I was thrilled — I was sharing a meal with some heavy hitters — this was cool stuff for me! In return for this perk, however, I was handed a lot of grunt work by the senior editors, for our main post-panel task was to transcribe and edit the proceedings for publication. I was assigned to proofread the transcript and to generate dozens of footnotes documenting facts and events described by the panelists, a hefty pre-Internet research project that ate up countless hours in the dungeon level of the law library. Working on this journal was my introduction to graduate-level scholarly work. I can’t say that the experience of developing footnotes from scratch to verify the accuracy of the panelists’ remarks was all that enjoyable! In fact, it persuaded me to pass up an opportunity to serve as a senior editor during my third and final year of law school. I didn’t want to spend my last year at NYU editing more manuscripts and chasing down more sources in the library. Now, of course, I’m writing hundreds of footnotes for my own scholarly articles. What a twist! Let’s just say that this was not a foreseeable development during my more anti-authoritarian law school days. I was in grad school, too, when this show was on. I remember that people were told not to watch it alone, but to be with friends, because it could be so upsetting! I did find it so unsettling. I watch almost no TV now, except live sports–I wonder if there’s a connection!